The McFadden Engineering team, from left: Brad Newton, P.E., Evan Bedwell, Elizabeth Ruland, Collin Degnan, Matt Pastorcich, Marshall Eschete, P.G., Art Hughes, F.E., Hope McFadden and Frank McFadden, P.E. 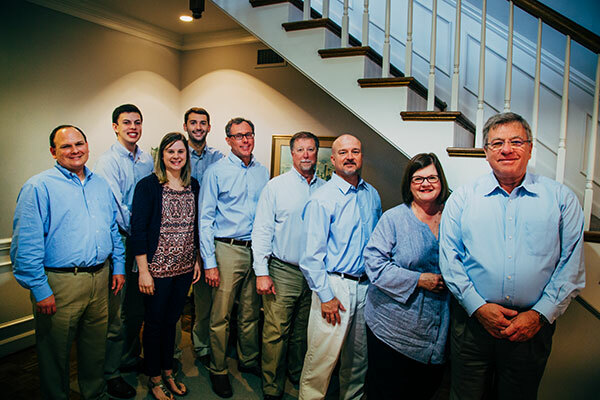 With roots in Mobile, Alabama, McFadden Engineering brings nearly a century of combined experience in civil and environmental engineering to the Southeastern United States. Our team of professional engineers and professional geologists are licensed in Alabama, Florida, Georgia, Louisiana, Tennessee and Mississippi, and are ready to solve unique challenges through our integrative and innovative approach. We work closely with the U.S. Environmental Protection Agency (EPA), the U.S. Geological Survey (USGS) and many other local, state and federal agencies to ensure our work exceeds expectations on the highest levels. As active members of the Water Environment Federation, Partners for Environmental Progress and the Geological Society of America, we are staying ahead of industry trends and informed on research in our fields. Let us partner with you on your next project. At McFadden Engineering, we succeed when our clients succeed. Vice President and Chief Financial Officer Marshall Eschete, P.G. Specializes in site investigation, water quality analyses and floodplain modeling Art Hughes, F.E.